eD@HoMe: My first Algerian cover! Hello! Here, I am sharing with you my first Algerian cover. It was sent registered from Setif, Algeria by Ouari Khemissi. Thank you very much! 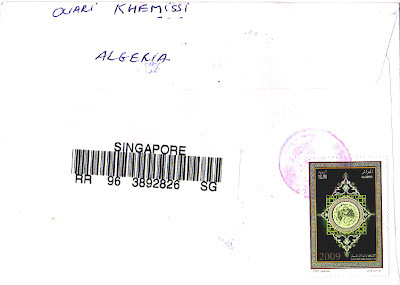 This cover is actually a FDC to commemorate the Algerian Presidential Election 2009. 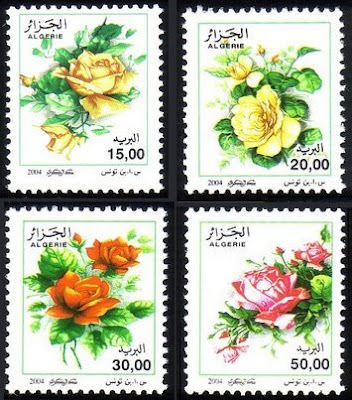 The lovely pair of Presidential Election stamps franked on the top, right of the cover have been cancelled with a first day of issue postmark on 09th April 2009 in M'Sila, Algeria. 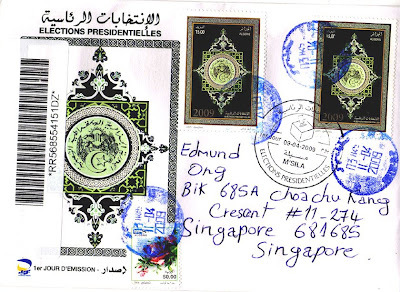 In addition, are 3 postmarks dated 11 April 2009 indicating the date that this cover was delivered into the care of the postal service while on the way to Singapore. To make up for the postage fee, a stamp from the "Roses" series (franked on the bottom of cover) and an additional Presidential Election stamp (back of cover) were used. 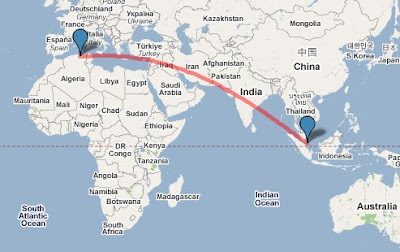 This cover took 35 days to travel an estimated distance of 10,674kms.